We brave people who dare criticize a star wars film are in a minority---decisively . Because like the people here the crowd in my city in India ( Bombay ) was cheering all the way and clapping when the old characters came back . Sadly , I was not among them . \r\nGot largely bored by the worst of the Star wars series of movies---The force awakens . Nothing new and no new technology . No new creatures . Landscape that is shown is bleak . Above all ,the earlier Star war movies had a grandeur that this movie does not . The old characters look old---could not bear to watch them becoming old and jaded . Should not have come back on screen---my memories of them at least would have remained young . Now whenever they come to my mind they will be old . \r\nThe force does awaken---in a most boring way . Simply does not evoke the emotion that was evoked when \'May the force be with you\' was said in the old movies . \r\nWont write a review , I guess . Even in my country ( India ) they will throw rotten eggs at me if I dare say anything against the movie . So skipping the review . Manager was taking whole team to the movie on Friday afternoon. I disappeared for an hour so I could give it a miss. Saw it with my bachcha log and the elder one (8) loved it. The younger one (5) was sleeping over it. \r\nThe effects are so 20th century, but it is still piggybacking on the characters and the theme which thrives some 40 years after the original. \r\nI found it OK, though i would prefer more earthly movies. I havent seen the original trilogy, but figured out who the good and bad characters were. \r\nAnd after the experience with age of ultron, i preferred watching the 2 D version of it. Because like the people here the crowd in my city in India ( Bombay ) was cheering all the way and clapping when the old characters came back . You still call it Bombay? Where do you hail from? Sena will catch him and fix him up for this. We brave people who dare criticize a star wars film are in a minority---decisively . Welcome to the club. In EC, quite a few go against the grain. \r\ni normally hate all the hit movies or the movies rated highly by the paid reviewers. Shakti Pai here is with you and gave star wars a miss. \r\nSena Lassi Pai also loves low rated movies and Sutradharji loves old Dharam paaji Amrapurkar movies. \r\nBut normally i see you give a default 3 stars to almost all the movies and you seem to love most of the movies you watch. Here\'s a viral video .. I think they are playing Star Wars music. \nWhen mom isn\'t home and the beat drops. i watch only the movies which have a positive buzz about them . am i a professional reviewer to watch even the bad movies ? a professional reviewer\'s job is to see all movies ( good or bad ) and write about them . but i see only the good movies---for i dont get paid a dime for these reviews . so i see only good movies ( or at least movies i perceive are suitable for my tastes ) and naturally they deserve good stars . \r\nThe producers pay the \'professional reviewers\' to give a positive buzz. So, a lot of movies will have a positive buzz. \r\nI know that I wont like the movies with hype or the positive buzz. \r\nBut the chances are that if I watch a Hollywood movie, I at least wont curse myself. I actually liked \'How to lose a guy in 7 days\' and many were surprised that I went for and like a \'chick flick\'. i actually see movies several days after the movies release , so i usually know whether the movie is good or not either through friends who have seen it or box office reports etc . so my \'positive buzz\' is real . Here is Bollywood version of Chewbacca. In fact an improvement. He can talk. forget this movie, coming to reality this is an indication that something has been hidden from the public by the USA. \r\nI do not know whether she will honor her promises. \r\nI believe all these UFOs could be some secret planes being tested by USA & being hidden from unfriendly countries.no wonder many of the sifghtings are from developed nations like US, europe, etc. Following this i have now covered almost alll the star wars movies. I have not seen \'Return of the Jedi (episode 6)\' and the latest \'Rogue one\'. The source has been library DVDs or blu rays. \r\nHere is the general take. \r\nNew hope - The first one in 77 is way ahead of timse. Apparently it was enhanced over the years, but introduces concepts like storm troopers r2d2, holograms, C3PO, etc. which become cult. It does leave a lot of things open which scream sequels and prequels. \r\nEmpire strikes back - Slow moving with one revelation in the end. \r\nPrequels - Crazy stuff with mostly CGI graphics. you can sleep over it. Only story happens in the last 40 minutes of episode 3 - Revenge of the sith. \r\nEpisode 1 - Saw it on screen in 99. Even then i guessed that this governor was the villain. It takes 2 more episodes to establish that. I didnt have any more background on star wars characters though.Seeing again on home video helped reconcile who the characters were. \r\nEpisode 2. very boring one. Just animation plus the marriage of Anakin skywalker and padme which happens in the last few minutes. \r\nEpisode 3. Last half an hour sets the stage for the main series. \r\nEpisode 7- Force awakens. Long but to star wars fans it brings back memories after 30 years. There was clapping in the hall when Harrison ford makes his entry with Chewbacca. Actually looks better if you have seen all the earlier episodes. Following this i have now covered almost alll the star wars movies. I have not seen \'Return of the Jedi (episode 6)\' and the latest \'Rogue one\'. Saw Return of the Jedi this weekend. The bachcha log who are star wars buffs also got bored watching it. It concludes the first series but is painfully dragged. \r\nPerhaps the \'flying motorcycles\' caught the attention of many when it was released. \r\nHad seen Rogue one on screen last year. RIP Princess Leia - Carrie Fisher who died recently. her mother who was also a famous actress died a day after. \nAnd she seems to have inspired the hairstyle of Rakhi in Muqaddar ka Sikandar. Got largely bored by the worst of the Star wars series of movies---The force awakens . Nothing new and no new technology . No new creatures . Landscape that is shown is bleak . Above all ,the earlier Star war movies had a grandeur that this movie does not . The old characters look old---could not bear to watch them becoming old and jaded . Should not have come back on screen---my memories of them at least would have remained young . Now whenever they come to my mind they will be old . 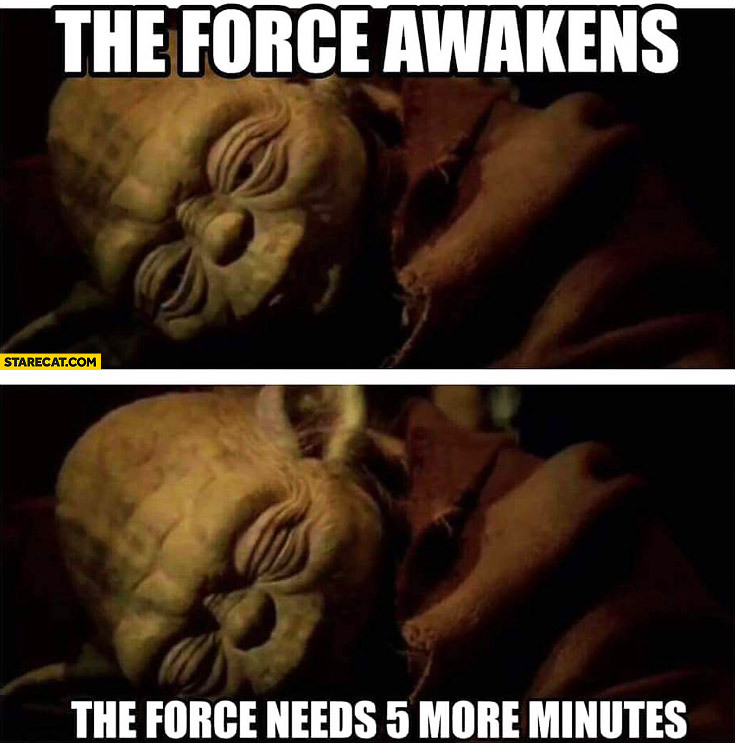 The force does awaken---in a most boring way . Simply does not evoke the emotion that was evoked when 'May the force be with you' was said in the old movies . Wont write a review , I guess . Even in my country ( India ) they will throw rotten eggs at me if I dare say anything against the movie . So skipping the review .